Click the button below to add the Zinc Range Hood "Los Angeles" to your wish list. 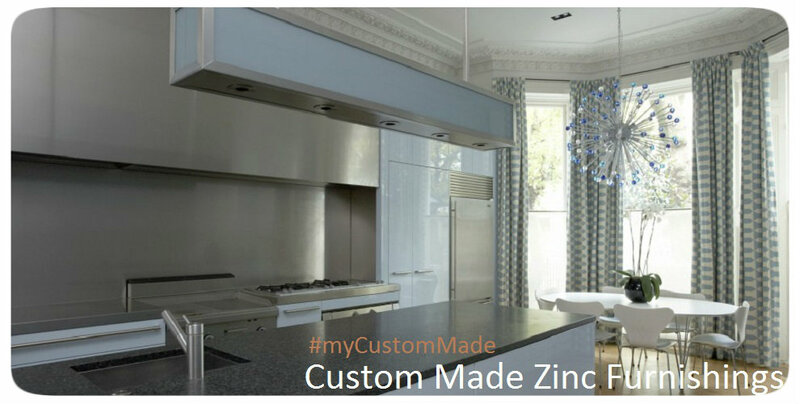 Kitchen equipped with a zinc hood looks modern and elegant. Consider for your next remodeling project wall mount or island zinc kitchen hood #F60904A as its main fockal point. Its apron is decorated with two vertical straps made of copper adding some rustic home decor accent. We designed this appliance for domestic gas and electric ranges. The hood is available with modifications for any venting equipment brand. It could be Broan or Vent-a-Hood linear among other manufacturers. Choose custom work option if the customization is going to be needed. As a budget alternative buy the hood with our own 200CFM ventilator, light and washable filters. Once installed in the kitchen this range hood will become instant focal point. Because of metal color it blends perfectly with any type of home decor.